Since moving back home to Spokane in late 1995, I have run every Bloomsday from 1996 to present just to get the shirt. Bloomsday is a uniquely Spokane event open to everyone. It's something special that sets Spokane apart. And I want the shirt so people will see that I've been there and done that. As Josh and Steph grew older they ran in Junior Bloomsday. What was cool--and important!--was that they wanted to. Junior Bloomsday was something that set them apart but still shared with friends and classmates. Held the week before the Lilac Bloomsday Run, it was a motivational stepping stone for when they would be old enough to run in the "real" Bloomsday. Every year they proudly added another Junior Bloomsday bib to their collections, displayed in their rooms for all to see. And they got a t-shirt. Then it all changed. For reasons I'm not clear on, the name was changed from Junior Bloomsday to America's Kids Run. (I've seen where the Lilac Bloomsday organization asked that it be changed and that the Department of Defense asked the Junior Bloomsday to set up runs at military bases. I don't know which, if either, is true.) The use of the Bloomsday name for 15 years certainly contributed to the huge numbers of children who came out to run. The first Junior Bloomsday had something like 3,000 kids and instantly became the largest organized kids run in the country. After that it exploded, enhancing Spokane's place as a mecca of running even more. It was something special that set Spokane apart. When Josh and Steph attended there were easily 10,000 kids participating each year. It was great. Then it all changed. The Junior Bloomsday organization became America's Kids Run before the 2002 event. Once the name change took effect the event has been referred to as "America's Kids Run (formerly known as Junior Bloomsday)". Sometimes you'd see it called "Junior Bloomsday, now known as America's Kids Run". Either way, the new name could not stand alone as a Spokane-specific event. The change made no sense to me. Races were organized at military bases all around the world--and one in Spokane. With the removal of the Bloomsday name and the imprimatur it conveyed, gone also was the feeling that this was something special and unique to Spokane. Gone was the feeling that the run was tied to the Bloomsday race held eight days later. Steph went a couple more times but it just wasn't the same. 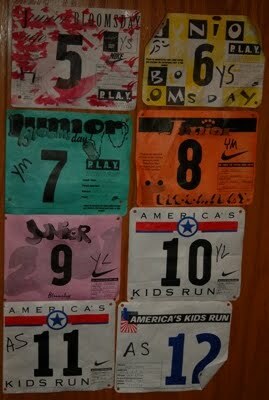 The generic looking America's Kids Run bibs looked out of place next to the colored Junior Bloomsday bibs of old. According to the Spokesman Review, only 1200 kids participated in the America's Kids Run held last Saturday. The run is moving out to Fairchild next year. The death knell rang for Junior Bloomsday eight years ago. Its demise is now complete. What a shame for Spokane. I agree with you 100 percent. I don't know what gets into the heads of those who organize events like this. The thought going through my head is that we can't use "Junior" in the name of the event because it is demeaning to the youth of our society. (No, I have no idea whether or not my thought is valid...) It's just a thought because we place too much emphasis on making sure kids don't feel bad about themselves. Kind of like giving every single participant in a track race a ribbon just for participation. Anyway, I am a military supporter, but I am curious why this has turned into a "military" event (based on your commentary...). Does this mean the Bloomsday run will eventually be called "America's Run"?